All canceled reservations received 60 or more days prior to arrival are subject to a 10% cancellation penalty. The following are directions from the north on Route 11. The timber companies maintain mile markers to help navigate, however, certain markers may be missing or damaged. 1. After passing through the Town of Eagle Lake, travel south/west on State Rt. 11 for about 8 miles. 2. Turn left (immediately before Hedgehog Mountain State maintained Rest Area) onto Pennington Road (gravel); follow to the end (should be multiple mile markers)—about 11 miles. 3. Turn left onto Square Lake Road and join mile 7.5. Follow Square Lake Road to mile 12.5. 4. Turn left onto Eagle Lake Sporting Camps Road—4 miles to the end; please open and close gate as instructed. The camps have seasonal access via 20 miles of privately maintained gravel roads. Please confirm the road is passable before attempting to drive to the camps. Call us from Ashland at (207) 444-5108 x 3 and give us a progress report. Leave a message with the time if our voice mail system answers. Cell phone service is spotty. A 4WD vehicle is highly recommended and a must during the wet conditions of spring and fall. Road repairs can force the road to be closed for weeks. Start your tradition of memorable visits to the historic Eagle Lake Sporting Camps. Awaken to the "dawn chorus" when male birds begin to sing, quietly at first, then loud and hard; and soon, every bird within earshot is singing simultaneously. You are the audience, your theater is a lakeside veranda. You are in Northern Maine—an unsurpassed destination for birders and wildlife photographers. But that's not all! Experience the world class May salmon fishing, late-summer trophy bear hunting or fall moose, grouse, goose, and duck hunting. Join a nature tour or guided hunt at the lodge of OMM Outfitters, Maine's only Cabela's World's Foremost Destination. Twenty-mile-long Eagle Lake, is one lake in the famous Fish River chain of lakes that stretches, in northern Maine, 60 miles through beautiful forest almost to the Canadian border, surpassing in primeval beauty and grandeur many of the better-known woodlands and lakes of Maine. 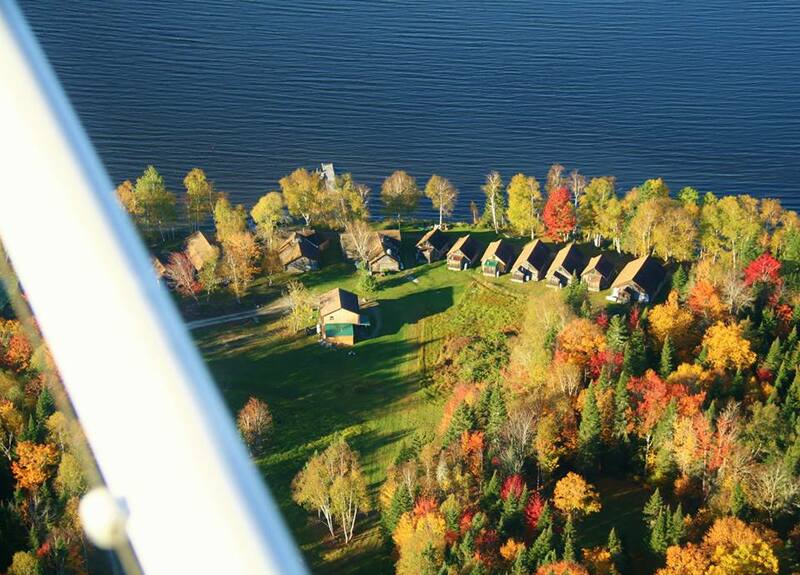 Established in 1889, the Eagle Lake Sporting Camps are located on a peninsula seven miles up the lake from Eagle Lake Village at the outlet of Square Lake thoroughfare and in the midst of a 23,000-acre wilderness reserve. We are on a high knoll among beautiful white birches, facing the lake in a southwesterly direction. The view is magnificent: lake and forest blend, ridge upon ridge looms up, until finally Three Brooks Mountain caps in the distance. Seven year-round log cabins accommodate from two to ten persons—up to forty guests. The cabins have gas lights and heat, and each has a private bathroom. An additional six cabins are for three-season use, with shared toilet and shower facilities. All the cabins are on the frontage facing the lake, and each has a broad veranda. For fine dining, the legendary Roosevelt Dining Room seats thirty. The Rough Rider Tavern has a large field stone fireplace, regulation pool table, and game room. Seven year-around log cabins accommodate from two to ten persons, up to forty total guests. The cabins have gas lights and heat, and each has a private bathroom. A generator provides electric power mornings and evenings. An additional six cabins are for three season use, with shared toilet and shower facilities. All the cabins are on the frontage facing the lake, and each has a broad veranda. Bed and Breakfast Rate: July 1 through August 25: $175 per night per couple, includes breakfast (limited availability). Lunch and Dinner is additional. See the Roosevelt Dining Room Menu. Spring Fishing/Birdwatching: May 15 through June 30: American Plan $150 per person per night; includes 3 meals; cabin; use of small boats; group orientation—2 night min. Birdwatching Tours: American Plan 3 nights lodging & meals, group guide for 2 days, photo album workshop, pontoon boat tour, use of small boats and kayaks, just $750 per person, double occupancy. Extra days $150 per person. Check-in on Thursdays May 15 to June 30. Summer Boating / Birding / Wildlife Photography: July 1 through August 25: American Plan $135 per person per night; includes 3 meals; cabin; use of small boats; complimentary pontoon boat tour; group orientation—2 night min. Fall Sports / Hunting: September through November 15: American Plan $175 per person per night; includes 3 meals; cabin; use of small boats—2 night min. Fall Waterfowl / Grouse Package: September–October: Your choice (season permitting) Goose/Grouse/Duck Hunt: 4 nights American Plan; 3 days of guided hunting on farm fields, thoroughfare, and timber covers (includes guide) - $1,895 per person (2 person hunt). Bear Hunt: Bait hunts start the last week of August and hound hunts start in October: Bear over Bait Hunt: $2,695 / Bear with Hounds $3,495 per person complete with up to 5 days of hunting 6 nights American Plan accommodations. Auction Tag Moose Hunt: September - October - November: Zone 2 - 3 - 6; Bull permits: $15,995. (e) including tag, guide, recovery, and American Plan accommodations; additional observer at $1,000. Arrangements must be made before February 1. If you happen to also win the public lottery, the fee is reduced to the recreation lottery winner rate. All rates, except for Bed and Breakfast, are subject to a two-night minimum stay. *Special Packages and rate details are listed within the accommodation details. The authentic log dining room has over a 100-year history of serving adventure seekers, business leaders, politicians, even royalty. The octagonal "Roosevelt" table was designed to be "politically correct" allowing "heads of state" and competitors to share a meal while each person has an equal space at the table. Housekeeping Rate: $160–$350 per cabin (three-night minimum), plus additional $40 per person fee for more than four to six persons depending on cabin size and season. Please bring your own bedding, towels, and kitchen paper products. Cabins have dishes, flatware, and pots and pans. American Plan Rates: (all inclusive rates) from $135 to $175 per person depending on menu and season. The rate includes the cabin, three meals a day, nonalcoholic beverages with the meals, use of small boats, kayaks, and afternoon tea on the weekends. Alcoholic beverages are extra. Fully licensed lounge has wine list, vintage ports, and cigars.